1841 1d Red-Brown, SG 8m, lettered R-D. A fine used four-margin example cancelled by a No 2 in Maltese Cross. 1843 1d Red-Brown, SG 8, Plate 38, lettered E-J. A very fine used four-margin copy - scarce with Maltese Cross on this plate. Cat £90. 1843 1d Red-Brown, SG 8, Plate 38, lettered N-C. A very fine used four-margin example. 1841 1d Red-Brown, SG 8m, lettered S-G. A superb used four-margin example with No 7 in Maltese Cross. 1841 1d Red-Brown, SG 8m, lettered M-H. A superb four-margin example with No 9 in Maltese Cross. 1841 1d Red-Brown, SG 7, Plate 9, O-E. A very fine used four-margin example. 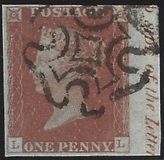 1842 1d Red-Brown, SG 8o, Plate 22, Q-E. A very fine four-margin example tied to piece by a very fine LARGE-TYPE DORCHESTER circular town datestamp. 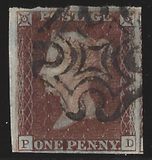 1843 1d RED-BROWN, SG 8k, PLATE 31, R-F - 'P' CONVERTED TO 'R'. A very fine four-margin example tied to entire to Aberdeen by a very fine CULLEN MALTESE CROSS. 1844 1d Red-Brown, SG 8, Plate 39, R-J, tied to opened out envelope from Bristol to Leeds showing a CLIFTON undated circle. 1843 Entire from Norwich to Wymondham cancelled by a cut into 1d Red-Brown, SG 8, cancelled by a distinctive Norwich Maltese Cross. Cat £1800. 1845 1d Red-Brown, SG 8, tied to cover to Newcastle by a NORTH SHIELDS '573' numeral and showing a very fine CULLERCOATS/PENNY POST alongside. 1853 1d Red-Brown, SG 8, N-A, with four margins tied to mourning envelope to Helensburgh by a Loughbrorough 475 numeral, showing a superb ROTHLEY undated circle in black on the reverse. 1841 1d Red-Brown, SG 8b, Plate 22, T-A RE-ENTRY, Spec BS11a. A Superb Used, four-margin example. 1842 1d Red-Brown, SG 8o, Plate 23, O-F. A very fine four-margin example cancelled by a very fine SMALL-TYPE DORCHESTER CIRCULAR TOWN DATESTAMP. 1841 1d RED-BROWN, SG 7, PLATE 1B, lettered F-G. A very fine four-margin example tied to neat, small envelope to Edinbrugh by a very fine Pittenweem Maltese Cross in Black. 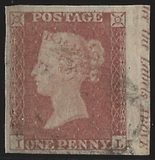 1841 1d Red-Brown, SG 8o, lettered N-I. A very fine four-margin example cancelled by a CIRCULAR TOWN DATESTAMP - PROBABLY 'LYME'. Cat £825. 1841 1d Red-Brown, SG 8L, Plate 22, lettered T-E. Very fine four margins, cancelled by a very fine central BLUE MALTESE CROSS.